Just thought I'd reach out to all folks who like me just received their Monoliths and are letting them breathe their first life. I am super pleased at how they are opening up after the first 5 hours of play. Honestly, the first hour made me cringe. They sounded like they were playing down a long narrow hallway. The next day I began to listen to my HDTs, then to Klipsch KLF30s, etc. to see if I just was being too harsh and judged the Monoliths negatively. They were just not up to snuff. Now on day 3 with 5 or so hours in, they are really beginning to relax and sing. I'm posting this so that if there are others out there lilke me with a new pair, you won't get discouraged by their breakin period. I moved the Monoliths from the Mystery Amp to the Rachel. Also changed room dimensional demands drastically. At about 11 hours in they are truly sounding amazing. Much more presence and detail. The ribbon tweeters were rocking from the start, but the main drivers are now catching up, and the integration with the horn cabinet is starting to feel seamless. I can relate to your first impressions. It's crazy how much they improve just within the first night of listening. By the end of the night I knew they were keepers. WOW! just 15 hours in (still connected with the Rachel) and these bad boys are unbelievable. They're even better than I recall from hearing them in Steve's listening room. Super detail and presence and punchy attack, particularly in the mids and uppers. I'd almost say they sound "bright", but the whole range is integrated. Base is now completelly seamless. All the muddiness in the bottom end has disappeared. They seem to be putting out seamlessly. Levine conducting Brahms 1 has never been this detailed. I completely agree. It's just amazing how seamless the presentation is considering the design. A two way horn coupled studio monitor. I've had a chance to listen to a lot of the speakers in the Decware line and they all share that detailed presence. I also have a pair of Parker 95 which a few years ago were one of the few speakers that would pair well to the 2 watt zen. Now days there are a lot of options out there and at very reasonable prices. The Monoliths are exactly what I had hoped for in that they have great detail and speed throughout the audio band, but yet have richness and weight that is absent in some others. I want to mention that the bi wire binding posts are durable and are a good fit for the price point these speakers fall into. However I found that removing the jumper plate and using a simple jumper wire improved the sound. Eventually I'm going to switch to a single WBT jack. I have no plans to bi amp. 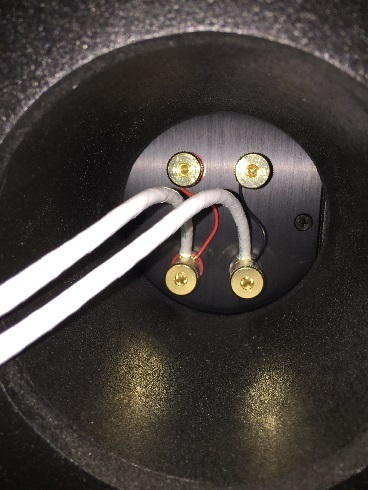 I use the Bi-Wiring connection with my DM945 monitors to double the gauge on my speaker cables. Same separate pairs of cables go to high and low frequency poles. The resulting overall gauge is double that of the single cable. Whether this helps or not is a matter of appraisal, but I find myself happier with this approach relative to the original single connection with the bridge. Ok, for those lurking and hesitant or concerned about buying the Monoliths -- Pull The Trigger!! They are awesome speakers. I'm totally sold on them, and still have less than 150 hours clocked. Surprising and superb base response; speed, presence, and clarity in mids and upper ranges. Absolutely no need for a subwoofer. Concur with the above comments on the Monoliths. The 1st couple of hrs I was very close to repacking and shipping them out. After a day or so they began to give a hint of opening up and halted my trip to UPS. Today after talking with Steve and getting advice on room placement along with installation of 2 dedicated 20amp outlets my amp was asking for, I will be pleased and satisfied with the Monoliths for a long time.